This is ridiculous. There is no circumstance where there should be empty seats at a Yankee playoff game. Sure, Miami got totally jobbed yesterday by the refs, but really, they lost the game before the blown call. 5 times in the red zone and 5 field goals? This game should have been 14-0 after 2 early Steeler turnovers left them deep in Steeler territory. But Miami played cautious and didn't go for it. It was all running against a tough Steeler run defense, or short, short passes. They deserved to lose. There are a ton of "What do the Yankees do now? article, including Joel Sherman's. And to sum up, Sherman says what I said 3 months ago. Jeter should get a $15 million per contract for 3-4 years. Also, Sherman feels Jeter should be moved down in the batting order—again, something that I said should have been done back in June. Move Gardner to leadoff and Jeter to second. Unlike Sherman, though, I don't think the contract situation with Jeter and the Yankees will be all that big a deal. They both need each other. How in the hell do the Ravens get only 1 sack against Ryan Fitzpatrick yesterday, when the Bills Demetrius Bell and have Cordaro Howard at right tackle? I guess the genius label is off Josh McDaniel. I guess the phenom label is off Chris Johnson. So far this season, he's had 3 games under 3 ypc. His ypc is down from 5.6 last year to 4.1 this year. He's still a dangerous back, but 2500 yards this season. Not gonna happen Chris. Seriously.....can we just get a freakin' playoff system? Funny thing about both the MLB playoff series. in each series, the better, more taleneted team lost. Both the Phillies and the Yankees, are, on paper, better teams. But neither showed up. And congrats to the Rangers and Giants for playing smart and hard. Should be a good World Series. And because he is too lazy to think of any other topic in the world of sports, Mike Lupica bashes A-Rod again. As if the Yankees lost the series only because of A-Rod. So....wow. 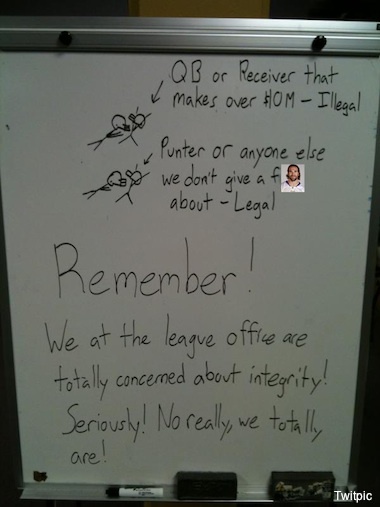 Think the Cleveland Brown coaching staff had a good game plan against Drew Brees? Is Ziggy Hood the first Steelers no. 1 draft pick bust since Troy Edwards? Starting to look that way after Aaron Smith went out with an injury and Hood still didn't get a huge amount of playing time. And this...is just stupid. "Smart Yankee fans know (that Jeter in a Red Sox uniform) would only help them." Please. Jeter had a down year and is getting older. yes. But he batted .270, which is 2nd highest for everyday AL shortstops. He scored 111 runs, 2nd in the AL and had the highest fielding percentage in the AL for shortstops. Now, of course, he is getting older and shouldn't be leading off. And he should def take off more days and DH some, but getting rid of him—idiotic. For the AAPTBNL Man of the Week.....gotta be DeAngelo Hall. Any time a guy gets 4 INTs in one game—taking one to the house—he gets the Man award. Congrats Hall. 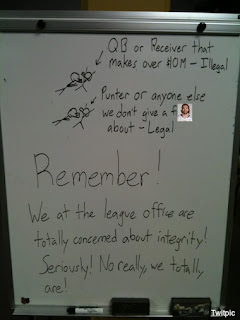 And lastly....one player's opinion of the new illegal hit system the NFL putting in place. Grats to DeAngelo Hall and his 4 INTs, but I've been saying for about a year now that Jay Cutler is this era's Jeff George. A cannon for an arm, but a pea shooter for a brain. I told my friend he was going to throw that last pick to end the game.